I am 15, live in San Diego, California and just finished 9th grade. Next year school starts at the end of August but we get 1 week off for Thanksgiving so it balances out. I grew up in San Diego... Been to many schools since Nursery School. I still dont understand that. Oh well. I went to 2 private schools (one from nursery - 2nd grade) then another from 3rd and 4th). The second one had uniforms and I hated it. The otehr one didnt but it was a school from nursery - 12th grade. Uniform school: K-6. In 7th grade I did field hockey. I still have my stick too. In 8th grade I did track and field. I have pictures from hockey but not digital. I will post if I can! 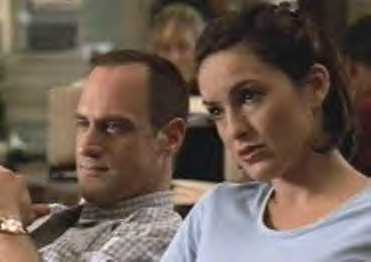 Detectives Elliot Stabler and Olivia Benson taking a break at work. I dont work right now but I wish I was workin with the detectives (see left) at the precinct (the 1-6) in New York City. Well, I am gonna be a cop in NYC... Yay! Hmm... this is hard.. There are so many *gasp*..
8) Angel - starting to grow on me. More stuff to come here!